Power. That’s the real problem for information and communication technologies (ICT) in the developing world. Specifically, electrical power, and the lack there of. All the coolest ICT tools, from radio to computers, the very Internet itself, require electricity, and usually vast amounts of it. Yet in the developing world, electricity is very rare and expensive. National electrical grids don’t extend past the national capitol or major trading city. Outside of population centers, electricity is generated by local, even personal generators. Often noisy, polluting, diesel or petrol generators that need constant repair, or very expensive and delicate solar panels that break or disappear overnight. Either way, electrical infrastructure costs usually exceeded the ICT investment, often by 2-3 times. These two opposing forces collided during the 2000’s, as the international development industry, local governments, and communities themselves tried to bring ICT to rural and underserved areas, with disastrous results. Untold millions of dollars, man-hours, and even computers were lost in these ICT for development (ICT4D) projects when energy sucking computers starved themselves and their hosts, as they gorged on rare, expensive electrons. We would still be wasting silicon and staff today, if it were not for one, very small invention that has literally revolutionized an industry: the Intel Atom processor. Today I went to the Wuse Market in Abuja, Nigeria to check on the ability of entrepreneurs to find business opportunities using 4P Computing platforms. I found an innovative mix of using computing power to enable mobile phone content, at a profit. Young men who invested in laptops are selling music, movies, and ringtones to market visitors at a tidy markup. Now ringtones and music sales is not new. Back in 2004, I heard of techies in the wilds of Mali selling ringtones and I got a few Gig of African tunes for a few bucks at a Senegalese cyber cafe. What I found innovative was the movie sales. 4P Computers that are coming out of the developing world. Not content to leave the 4PC market to Asus, these local computer manufactures are making their own low-cost, highly-portable, power-efficient, and performance-relative computers for local and regional markets. 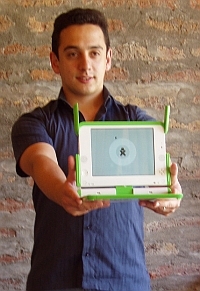 Three years ago, the IT industry was shocked with a radical idea – a “$100 laptop” designed specifically for education in the developing world. Price would be low and yet quality high, through innovative design mixed with low-cost components, and sales would be focused exclusively on the developing world. This heretical bombast upset the longstanding computer manufacturing tradition to keep adding functions to maintain high prices in the developed world, while ignoring the developing world. 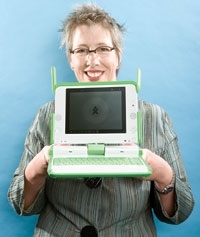 While the revolution was lead by One Laptop Per Child and its visionary founder, Nicholas Negroponte, we now have a whole plethora of revolutionaries – from the upstart Asus to the goliath Intel – who are developing 4P Computers. 4P Computing is a new class of appropriate technology – computing power, performance, portability, and price specificity designed for the realities and markets of the developing world. Last August, I crowded a few friends into a Japanese restaurant in Silicon Valley to talk about technology in the developing world. Back then, the discussion swirled around One Laptop Per Child, as it was the most visible manifestation of our collective drive to spread appropriate information and communication technology beyond the world’s elite. That’s because three years ago, Nicholas Negroponte stunned the technology industry and the development community with an amazing idea: One Laptop Per Child – a rugged yet low-cost computing device, the XO laptop, can empower primary education in the developing world. His idea that low-power, appropriate performance, highly portable, and low-priced computers were not only possible, but could also radically change education in the developing world and computer manufacturing in the developed world was an instant hit with Presidents of the Global South.